These machines excavate the main outfalls for the bog drainage system in the development stages and maintain main outfalls and rivers during the production life of the bog. While these excavators are generally of conventional design and are suitable to take dragline, back and front acting shovels, and pile driving attachments, they are used mainly with the dragline attachment. The machines are powered by a diesel engine, all drives are mechanical with friction clutch and brake control of winches and turntable while the track drives and steering are controlled by claw clutch and brake arrangement. The 3/8 Cu.Yd. model has catarpillar type tracks with timber sleepers which provide the necessary bearing area for operation on bog, without using mats. The 5/8 Cu. Yd. model while equipped with caterpillar track chains is not fitted with track sleepers, but is supported on timber mats where necessary. 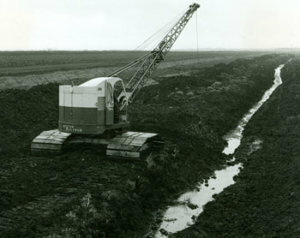 When excavating bog only, as distinct from subsoil, these machines are fitted with a special dragline bucket of light design with a capacity of 1 cubic yard. Used to remove slurry from the bottom of milled peat field ditches and dispose of it by spreading it on the adjacent field - Read about the Screw Drain Cleaner.